Ogden, Utah – November 11, 2015 – Ogden is thrilled to welcome back the second annual USA Cycling Fat Bike National Championships. Slated for February 27, 2016, this event will take amateurs 12 miles across Powder Mountain’s Hidden Lake terrain while pro and open class riders will compete on over 18 miles of challenging terrain. Last year’s championships were also held in Powder Mountain. The men’s Pro National Championship was won by Ned Overend and the women’s Pro National Championship was won by Amanda Miller. Fat Bikes have gained attention as the fastest growing segment of the bicycle industry. These bikes have a “go-anywhere” capacity and are capable of extreme all-terrain conquests through the harshest elements all year. During the championships spectators can experience the rush of riding a fat bike through free bike demos provided by Borealis and local bike shops. Spectators will also have an opportunity from Rockstar to win a Fat Bike of their own during the event. Land managers and bike advocates will have a chance to discuss fat bike issues on public lands at the Regional Fat Bike Summit on Friday, February 26, 2016. 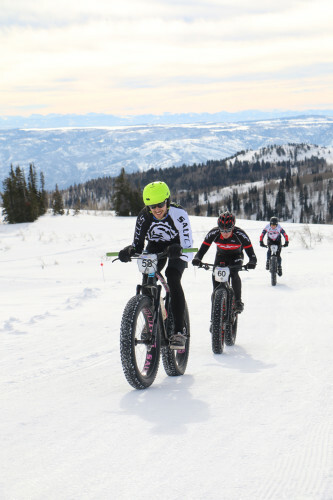 Those who make their way to Ogden during the Fat Bike Championships can also look forward to the US National Snowshoe Championships February 27-28 being held at Powder Mountain and Snowbasin Resort. Junior athletes will compete on a 5km course while those 20+ will race on a 10km course at Powder Mountain on February 27. A citizens 5k race will also take place on Saturday. Racers of all ages can register as late as the day of the event. On February 28 a half and full marathon and 10km team relay for qualifying athletes will take place at Snowbasin Resort. Additionally, the second annual Ogden Ski Week will take place February 21-27. During Ski Week some of Ogden’s most eclectic shops and galleries will have extended hours, restaurants will have taste-bud tingling specials and bars will be thumping with live music. Fat Bike Nationals will be held in Grand Rapids, Michigan in 2017 and 2018.